Where We Can Have You Smiling! The Mouradian Smile Boutique is one of the leading cosmetic dental practices. It is a new state-of-the-art Syosset dental facility where our team will meet your every expectation in creating the smile that you have always wanted and maintaining the smile you already have. Dr. Angela Mouradian will always be there with a friendly smile to care for our patients. She understands beauty and fashion, as well as function in the mouth and face. Over the last decade, Dr. Mouradian has also studied, through pictures and photography, the various trends in smile design. Dr. Mouradian, the top dentist in Syosset, understands what is contemporary, esthetic smile designs. Come in for a consultation and dental exam if you are considering any dental work especially if you are considering cosmetics. Patient satisfaction and excellence in dental care are our main goals and we work together as a team in order to achieve them. Our compassionate and understanding Syosset dentist takes pride in paying close attention to each patient’s needs and customizes each patient’s treatment as to best fit their needs and expectations. Dr. Angela Mouradian is highly trained in every aspect of general, cosmetic and implant dentistry. She loves to make her patients smile. The Mouradian Smile Boutique is committed to providing each patient with an exceptional level of care and attention. Our dedicated staff works together as a team to provide high-quality comprehensive care for our family of patients. We work hard to make our patients happy and to keep them healthy and smiling. We are looking forward to meeting with you where we can have you smiling! Book your appointment today! Dr. Angela Mouradian is a graduate of SUNY at Stony Brook Dental School in 1999. Dr. Mouradian has completed one year of Advanced Education in General Dentistry at SUNY at Stony Brook Dental School which was completed in 2000. She is one of the leading cosmetic dentists on the North Shore of Long Island. 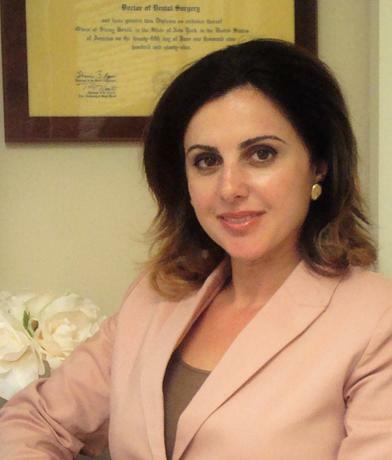 Dr. Mouradian strives to provide excellent care for her family of patients. She has refined her skills with numerous continuing education classes which keeps her practice on the cutting edge of all the latest techniques and materials in the dental field. Dr. Mouradian's compassion and sincere wish to help others are some of the traits that make her truely unique and likeable by our family of patients. ©2019 The Mouradian Smile Boutique® - Do not copy. All rights reserved.